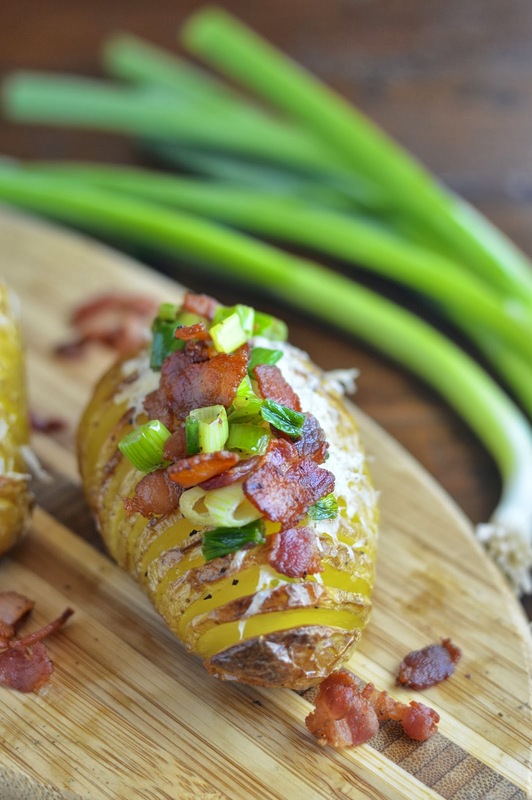 Potatoes, butter and bacon…oh my! I have always admired beautiful pics of hasselback potatoes. The thinly browned slices, glistening with butter are so simple yet so brilliantly beautiful. It’s hard to take a bad picture of a hasselback potato. Add some bacon, Parmesan cheese and scallions and you basically have a work of art. I thought it would be hard to make these crisp brown forms of a baked potato. I was so wrong! They are easy peasy, and that’s no joke. Why was I intimidated? I truly don’t know. You simply cut vertical slices about 1/8 to 1/4 inch apart and then insert thin slices of butter. A little salt and pepper, bake and done. Sky’s the limit! Or you can just bask in the simplicity of a perfectly roasted potato. I love the combo of scallions, Parmesan cheese and BACON, so this topping was a no brainer for me. I ditched the typical cheddar and went for something a bit nuttier and distinct. You can only imagine the sighs of joy when my kids walked through the front door to smells of bacon and butter. For them this was the perfect after school snack – two each! I know - they have big appetites. My daughter had run a 5K during PE and well my son at 16 just eats a lot. Just as a side note. I’m working on a fairly large recipe testing project, which really pulls me away from my blog. I will try and keep the posts coming, but I will probably only be posting twice a week as opposed to three. Even the best of us can only spend so much time in the kitchen! I love recipe testing, so it’s all about balancing the best of both worlds. But please make time for these potatoes. You won't regret it. Pre-heat oven to 425 degrees F. Clean potatoes and pat dry. On the bottom of each potato cut off a small 1/4 inch thick piece of potato so that it will lie flat. 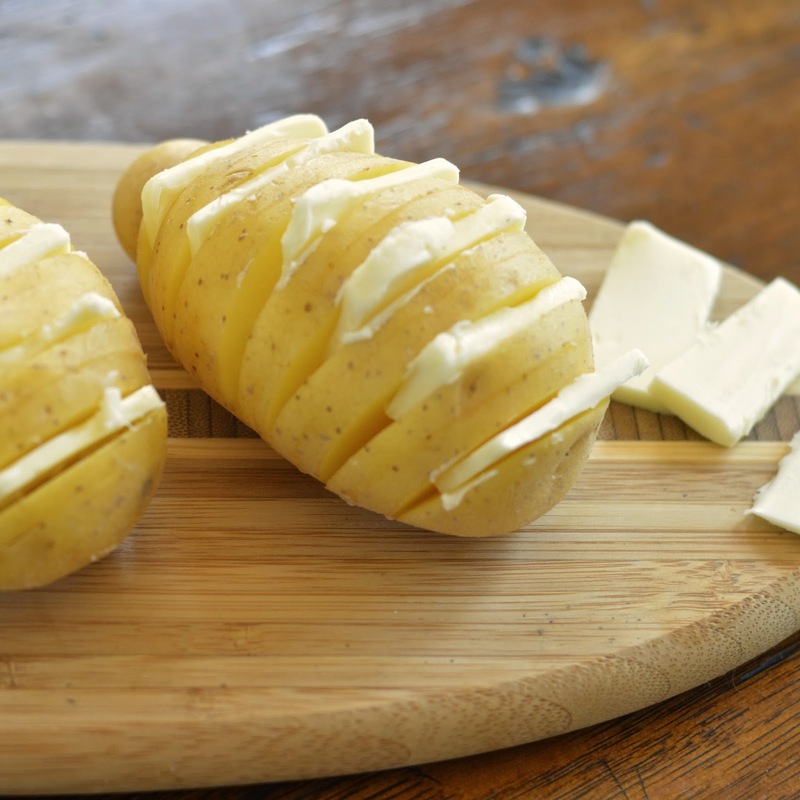 Cut vertical slices in the potato, 1/8 to 1/4 inch wide. Make the slices deep but don't cut all the way through the potato. Slice the butter in thin pieces and then cut in half. Place butter slices in alternating slits of the potato. Season with Kosher salt and pepper to taste. Put potatoes on a sheet pan or in a casserole dish and bake for 40 to 45 minutes, basting with the melted butter every 15 minutes. Potatoes are done when the skin is crispy and the flesh is easily pierced with a fork. While potatoes are baking, in a medium skillet cook bacon on medium high until golden brown and most of the fat is rendered. Remove bacon with a slotted spoon and place on a paper towel to drain. Add scallions to same skillet and cook in bacon fat for 2 to 3 minutes, until lightly wilted. Remove from the pan with a slotted spoon and place on the paper towel with the bacon. Top potatoes with cheese (you can nestle some of the cheese into the slits) and cover so the cheese melts (or place back in the warm oven for a few minutes). 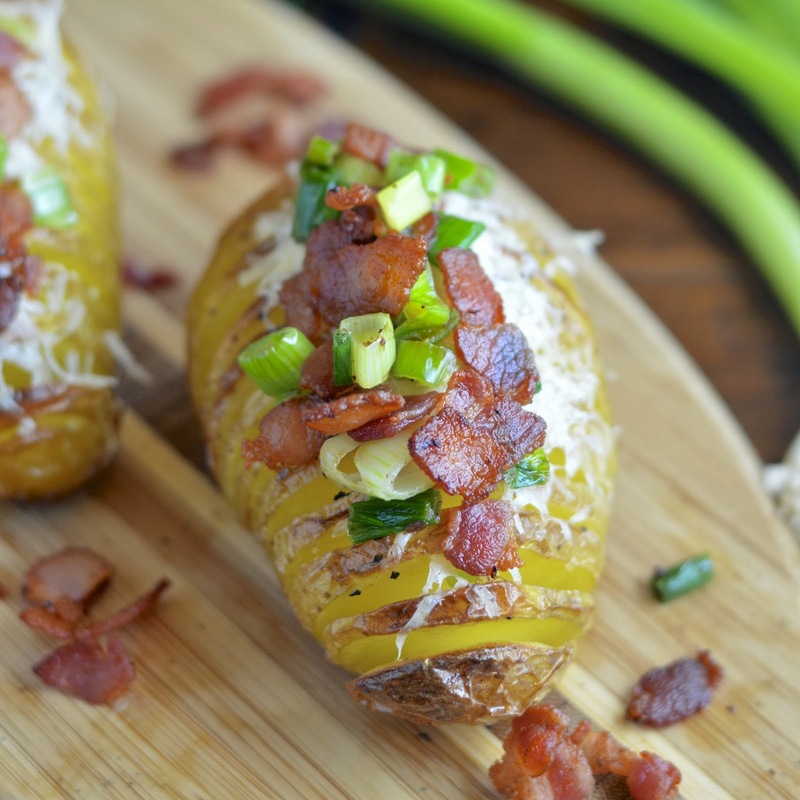 Divide the bacon and scallions between the four potatoes and serve warm. These look so perfect! I would love to give it a try too!